The 2011 Autumn Lleyn Sale season has set off to a good start with shearling ewes and ewe lambs both well ahead of last year’s averages. A 95% clearance rate of females and a 90% clearance rate of rams was seen. For the third year running DN Bennett & Sons, Powys won the shearling ewe class and went on to sell them for £200 a head to Collacombe Farms Ltd, Tavistock. The top price went to Hefin Llwyd, Okehampton with his second prize pen which sold for £210 to Cator Blackaton Farming, Newton Abbot. AW Davies, Pwllheli & Chilbolton Farms, Hmapshire had £200 selling to Perkins & Partners, Lifton and M Childs, Tiverton respectfully. The overall average in this section was £160.36, an increase of £24.94 on the year. The ewe lamb section was won by Dai & Cynthia Morris, Carmarthen with lambs bred from the 2011 Royal Welsh Show Champion, Penywern Maldwyn. They sold for £128 to SP Gubbins, & Son, Launceston. 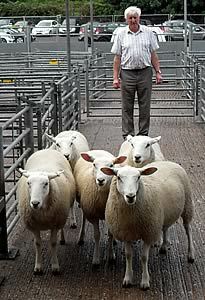 The second prize ewe lambs came from DN Bennett & Sons and sold for £170 to Collacombe Farms Ltd. In the ram section the top price went to Emrys & Dylan Jones, Machynlleth with their shearling ram selling for 1950gns to G Martyn & Son, Launceston. 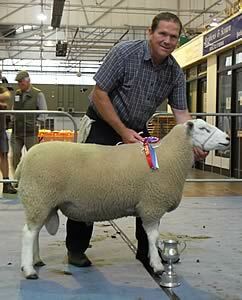 Next to top was the Champion from AW Davies which realised 1300gns to MH Miller, Dorset. 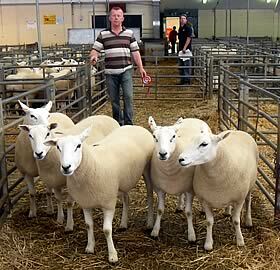 Seven rams in total realised 1000gns and over.